Digger to the rescue! These blueberries needed help. But look at 'em now! When we moved here 5 years ago, the owners before us had planted a few blueberry bushes. Due to the previous owner's illness, these bushes had been neglected. What with all the other projects on our plate, we basically continued the neglect. We harvested some each year, but the blueberry crop was getting pitiful-er and pitiful-er. Finally, it looked as though the bushes were actually dying. Wake up time. 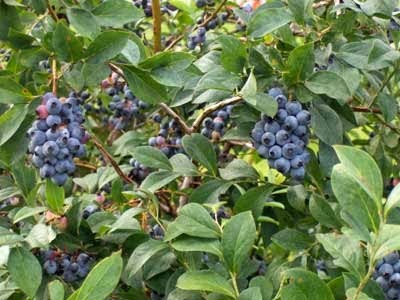 After reading up on blueberry bush care , we set about trying to save our established bushes. First thing, fall before last, we did a major blueberry bush trimming . The pine needles are plentiful around the property, so we gathering several loads to use as much. 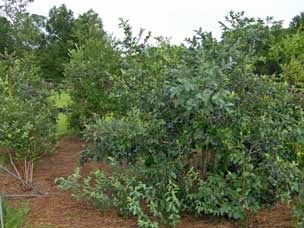 Blueberries favor acid conditions and the mulch would also help retain moisture during our drought periods. 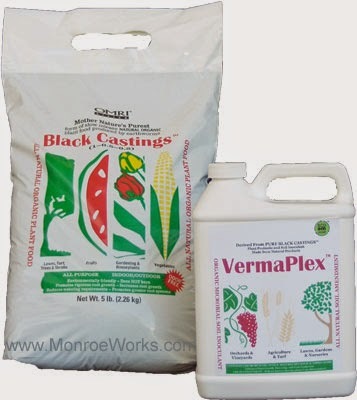 We scattered Pure Black Castings ® (organic worm castings) around, then inoculated with VermaPlex ®. Last summer, the bushes looked vastly improved and produced a better crop, although not yet up to their full potential. We had done such a severe pruning to remove the dead and sick canes, the bushes put a lot of effort into new cane production. At the end of the season, we mulched with pine needles again, pruned a little, and left them alone. When spring rolled around this year, we once again scattered worm castings (make your own!) around the blueberry bushes, inoculated with VermaPlex ® and set back to watch. The bloom production was quite prolific- all the bushes, even the ones we thought were close to death just the previous year, were covered. The bees were a-buzzing and the mouths were a-watering in anticipation of the bounty to come. We weren't disappointed. 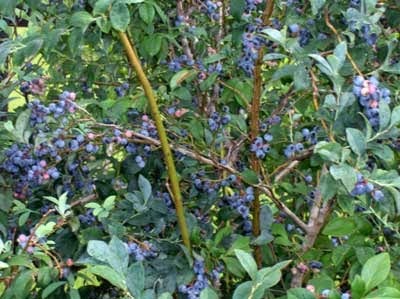 The blueberry bushes that were so pathetic are absolutely loaded with fruit. The fruit is larger and there are more clusters. After holding off as long as we could (when the birds show up, you know they're ready), we are now harvesting and freezing blueberries as fast as we can. A good way to harvest just the ripest and sweetest: hold a pan under a cluster of blueberries and gently rub your hand over it to loosen just the ripe ones. They will fall into the pan and the unripe blueberries will stay on the cluster. What we don't 't eat we freeze. 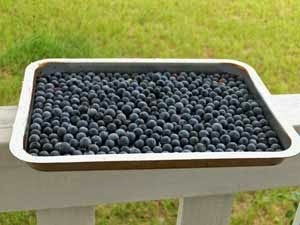 Fill a shallow tray with one layer of dry blueberries. Put into the freezer and freeze until hard (doesn't take too long). Dump the frozen blueberries into gallon or quart size baggies. Return the baggy to the freezer. A tray of blueberries ready for the freezer. Blueberries are the king of fruits when it comes to antioxidants. And we all now how important antioxidants are in the diet. If it's true they help in longevity, I'll live to be 100 (gosh, that's 700 in dog years). There are so many blueberries, nobody noticed the bushel or so I swiped. Blueberries are high in vitamin C and low in calories, so go ahead - pig out. And the flavor! Bon appetite! Melt butter in a 9 x 13 baking dish. Mix sugar, flour, and milk together. Pour Blueberries over the batter. Can't wait for the dead of winter for one of Bill's blueberry cobblers. In the meantime, there's still some easy pickings left on the canes (while nobody's watching, of course). Application Instructions : Pure Black Castings® and VermaPlex® rate guides for blueberries and other fruits. Pure Black Castings® : Certified organic worm castings. Slow release and all natural. VermaPlex ®: Liquid microbial soil inoculant. Made from Pure Black Castings®. Earthworms for Vermicomposting : Make your own worm compost full of rich castings from your garbage.